Working as a preparator, I’m halfway through a two-week install involving lots of building. It’s exciting and exhausting, requiring focus and grace. You work with materials, tools, people, institutions, vendors… elevator systems, security systems. You aim to please, perhaps even aspire to perfection, yet you have to manage expectations, including your own. Preparators are only midwives to artists’ visions, but pride—not to be discounted—is at stake. Behind the impression of timelessness that artworks and exhibitions strive for is a lot of risk/hopethatworks/noonewillknow. Dive in, fight fatigue, feel crumbly yet alive, playing a role in a complex that fuses creative ambition with material reality. In my research about Jim Hodges this weekend, I came across examples of the paradoxes/great cosmic jokes that preparator work involves. Jim Hodges, Untitled, 2011 Mirror ball, mechanics and water; dimensions variable. Source: GladstoneGallery.com. 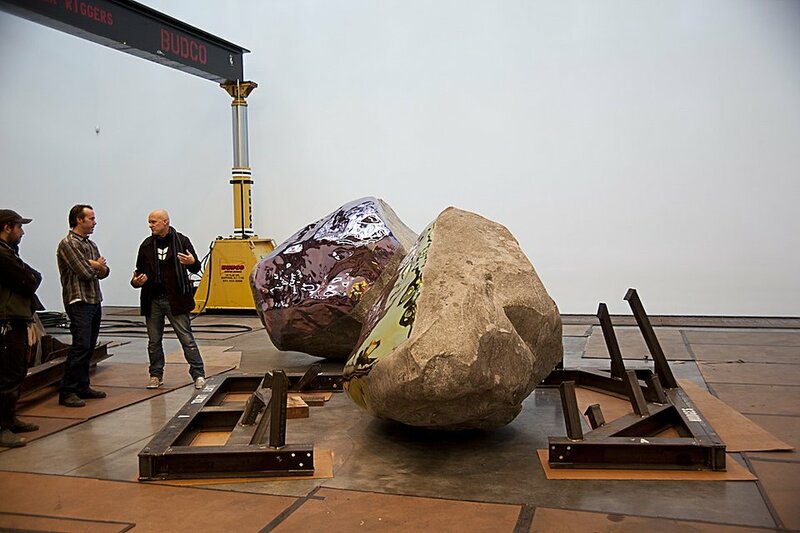 Jim Hodges oversees the deinstallation of Untitled at Gladstone Gallery. Source: WalkerArt.org. Different locations, same artist, same gallery. Second image: Concrete floor protected in gaffer-taped Masonite. Note pieces cut-to-size for break-away brace. Nifty. In art and art exhibitions, the visible is often just the tip of the iceberg, while many more systems, materials, labor, and even experiences, are kept invisible.